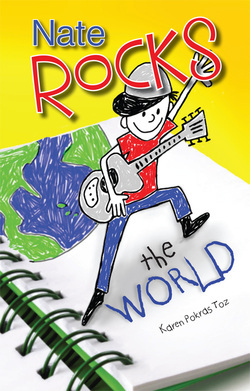 If you were to blend Tales of a Fourth Grade Nothing and Diary of a Wimpy Kid, you might come close to what you find in Nate Rocks the World by Karen Pokras Toz. Life is rough for ten-year-old Nathan Rockledge. He’s not very popular at school. He’s tortured by his older sister, Abby. His mother thinks she’s Julia Childs and Martha Stewart combined when she can’t cook or sew, and his father insists upon retelling stories from his own childhood over and again. But with his sketch pad and a healthy dose of imagination, he can become Nate Rocks, a hero who can do anything. This is a fascinating and fun story that middle grade boys are going to love. Nate can’t catch a break. School is painful at best, especially when he gets paired up with Lisa Crane for a science project. Nate’s mom and Lisa’s mom are good friends, so he better be on his best behavior or someone is going to hear about it. He’s got a best friend, Tommy, but when they’re together things just don’t seem to go their way. His sister Abby is a royal pain in the neck, but their parents are always asking for his understanding while she goes through a phase. Even the family vacation can’t turn out right if he’s around. What makes it all bearable is Nate’s ability to totally get lost in his drawing, daydreaming of how he becomes Nate Rocks and can do anything. He can help Captain Asteroid defeat the evil Dr. Shadow. His great baseball skills can turn the Phillies into a championship team. He can even save the neighbor’s dog from a burning house. Toz definitely has a finger on the pulse of this market. She knows what’s exciting to them and uses it to create a page-turner that will leave them wanting more. There were a couple of places I felt a bit lost in the transitions between Nate’s reality and his daydreaming, but overall the story flows smoothly. I could definitely see Nate Rocks the World as a movie–a very funny movie. The author mentioned to me that she’s busy at work on the sequel. I can’t wait! I received a FREE Kindle version of this book from the author in exchange for my honest opinions. The author paid me to promote this book with a virtual book tour through Pump Up Your Book. That fee did not include a review. I received no monetary compensation of any kind to provide my opinion. Journey to the Kingdom of Muse where the Puzzle King and his subjects enjoy putting together puzzles. But King Falmore has been so busy working on puzzles, he hasn’t made time to find a queen. Calling for the help of his sorcerer, Sorbo, the king instructs Sorbo to find him a queen–a queen who loves puzzles as much as he does. Stumbling upon a book in his massive library, Sorbo soon discovers it’s not a book at all, but a golden box filled with millions of puzzle pieces; and Sorbo is certain he has the answer King Falmore is looking for. As everyone helps the king to put together the largest puzzle they have ever worked on, it soon becomes clear that Princess Daisy, the future queen of the Kingdom of Muse, has been trapped within the puzzle and only a person who truly loves her can put her back together again and break the curse. What a fabulous first book from debut author Nina Cordelia Craft! In this unique and fun adventure, an entire kingdom is caught up in the search for a queen to rule alongside their beloved king. Based upon a story that the author created for her grandchildren, Craft has written an engaging and captivating story that all young lovers of fantasy, kings and queens, and puzzle solving will enjoy. Hillie Dijk provides the charming cover art and inside illustrations for The Puzzle King. The cover art is stunning and the thumbnail can’t hope to do it justice. This is a must read for young people and at only $9.95 it is an excellent value. I highly recommend The Puzzle King and look forward to Craft’s next book, The Puzzle Princess.